While speaking in the chamber of the House is a high profile activity for an MP, much other work is done elsewhere, in committee, as well as a large casework load for constituents. Mr. Douglas Hogg (Sleaford and North Hykeham) (Con): On a point of order, Mr. Speaker. I have given you prior notice of it, and I have given prior notice to the hon. Member for Carlisle (Mr. Martlew), whom it concerns. There is, as you know, a planning application in my constituency for intensive dairy production at a place called Nocton. It has aroused intense feelings and opposition, part of which is founded on animal welfare considerations. The hon. Member for Carlisle tabled early-day motion 1037 which addresses the issue both in general and in particular, mentioning my constituency as the site, or at least that is the implication. He did not discuss this with me in advance; I am sure that he intended no discourtesy. I do not think that there is guidance on the matter, so I am looking only to guidance for the future. May I suggest that in future, when an hon. Member tables an early-day motion which affects another Member's constituency directly, the Member tabling the early-day motion should inform the other Member in advance, very much as he or she would if he or she were going to the other Member's constituency? I do not for one moment challenge the hon. Gentleman's right to table the early-day motion, but it would have been helpful and, I suggest, courteous for me to have been told in advance. Mr. Speaker: I am grateful to the right hon. and learned Gentleman for giving me advance notice of his point of order. Clearly, as he indicated in what he said, the matter is of specific relevance to his constituency. The House is well aware of the conventions about visiting other Members' constituencies, and about mentioning each other in debate. As the right hon. and learned Gentleman rightly observes, we do not have a practice on giving notice about tabling motions, but he has made his point very effectively. I know that others will thereby be conscious of the matter. Mr. Speaker: Order. The hon. Gentleman should be patient. His patience will be rewarded in due course. The hon. Member for Carlisle (Mr. Martlew) is in his place. He is not obliged to respond, but if he would like to do so, he is welcome. Mr. Eric Martlew (Carlisle): Thank you, Mr. Speaker. The right hon. and learned Member for Sleaford and North Hykeham (Mr. Hogg) is a barrister, but I was hoping that you would find me innocent of the crime, Mr. Speaker. I did not mention the right hon. and learned Gentleman, and I did not specifically mention his constituency. I referred to Lincolnshire; I did not know the site was in his constituency. The precedent that could be set is that if any hon. Member tabled a question about any constituency, he would have to tell the hon. Member concerned. I hope that you will find me innocent. Mr. Speaker: What I would say to the hon. Member for Carlisle is that I have sought to respond to the point of order from the right hon. and learned Member for Sleaford and North Hykeham (Mr. Hogg) in measured terms, just as he spoke in measured terms, and so did the hon. Member for Carlisle. I do not view the matter, if I may say so, in terms either of guilt or of innocence. The situation that has arisen is quite specific, a repetition of which could occur. Rather than formulate a new rule or piece of guidance on the hoof, I would prefer to rely on the general good sense and natural courtesy of right hon. and hon. Members. Mr. Eric Martlew (Carlisle): On a point of order, Mr. Speaker. 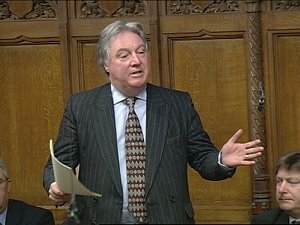 Thank you very much for the speedy way in which you have dealt with the issue that I raised, but is not the real reform that we need in the Palace of Westminster that Secretaries of State in the House of Lords should be obliged to come to this Chamber to make statements to the democratically elected Members and answer questions? Mr. Speaker: There was I thinking that I had satisfied the hon. Gentleman's appetite. He is an experienced Member of this House, and he knows that that is another matter. It is an important matter, on which there has been some discussion and to which the House will doubtless in due course return. I cannot, however, say any more about it today. I hope that he will be pleased with what he has got. Mr. Eric Martlew (Carlisle): On a point of order, Mr. Speaker. I have raised a lot of points of order over the past 20 years, and I do not think that any of them have been in order, but I hope that I will be successful this time. Last Thursday a statement was made in the House of Lords by the Secretary of State for Transport. It was 40 minutes before that statement was made here. I went to the Table Office to get a copy of that statement after the Secretary of State had sat down, but I was told that it would not be available until it had been made in this place. I then went to the House of Lords and got a copy of the statement. Surely that cannot be right, and surely it cannot happen again in future. Mr. Speaker: It would give me great pleasure if I were able to satisfy the hon. Member for Carlisle (Mr. Martlew), but I fear that I cannot. I entirely understand why he and others might have been frustrated by this; however, it results from the simple fact that the Secretary of State- [ Interruption. ] Order. The hon. Member for Peterborough (Mr. Jackson) should be quiet when I am ruling on the point of order that has been raised. What happened arises from the fact that the Secretary of State for Transport is a Member of the other place, and although there are arguments about accountability to this place and so on, that is the situation. Mr. Martlew: Further to that point of order, Mr. Speaker. I do not have any disagreement with that; in fact, I have advocated that the Secretary of State should come to this Chamber. However, statements should be made available to Members of this House after the Secretary of State has sat down, because they are available to noble Lords and the general public. Mr. Speaker: Those Members are in another House. I entirely understand what the hon. Gentleman is saying, but it is not clear to me that an immediate resolution of the issue is available. However, I will reflect, as I always reflect on what he has to say, and if I have anything further to report, either to him or to the House, he and the House will be the first to learn of it. Mr. Eric Martlew (Carlisle): I congratulate the Minister on these excellent proposals, and on rejecting the Conservative proposal for the line to go from Manchester to Leeds, cutting out all of Cumbria and south-west Scotland. Having said that, can we talk about the fork? When they get to the fork, do the Government plan to build both lines at the same time, or one after the other? I suspect that the west coast line is more congested. Also, does he agree that it would be nonsense to run a high speed line 90 miles through Cumbria and not permit it to stop anywhere in that county, especially in Carlisle? Mr. Sadiq Khan, Minister of State, Department for Transport: I suspect that whatever answer I give on which line goes first will lose me the support of half the House. That is one of the things HS2 will be looking into when it considers the next phase in relation to Manchester and Leeds. My hon. Friend is right to remind the House that other parts of the country will benefit from the project. On having a stop in Carlisle, it is worth pointing out that one of the choices we have to consider is having fewer stops, and therefore faster trains between areas of mass population, which would free up capacity on the trains that do go to Carlisle. Mr. Eric Martlew (Carlisle): Can the hon. Gentleman confirm that Conservative policy is to cull badgers in England? Mr. James Paice (South-East Cambridgeshire) (Con): Conservative policy is to attack this disease with a comprehensive strategy using all available measures and, yes, that does include recognition that will require selective culling in certain hotspots, but not across the whole of England, as the hon. Gentleman implies. We will continue to study the science as it develops over the next few weeks and months. A vaccine that is of any use - an oral vaccine, in other words - will not be available until 2014 and, at the current rate of expansion anything between 80,000 and 100,000 head of cattle could be slaughtered each year by then. I suggest that we cannot wait until 2014 for any improvement. Mr. Martlew: I worked in the food industry for more than 20 years. If the hon. Gentleman is correct, why do we get copycat products - own-brand products - with very similar packaging to the branded goods appearing on the supermarket shelves beside the branded goods? If the supermarkets want to keep a good relationship with their suppliers, why do they try to copy the packaging of the branded goods? Philip Davies: The hon. Gentleman may think that all of his constituents are stupid and cannot tell the difference between an own-brand product and a branded product. He seems to follow the theme of what this Labour Government think - that everybody is so stupid that the Government have to decide everything for them - but I actually have more faith in consumers. I think that my constituents, who I am not entirely sure are greatly different from the hon. Gentleman's, are perfectly able to decide whether they want to buy an own-brand product or a branded product, as they can tell the difference between one that says Tesco on it and one that says Kellogg. Mr. Martlew: The hon. Gentleman's language about my constituents being stupid is offensive, Madam Deputy Speaker, but I am used to him being offensive. If the supermarkets do not want to deceive, why do they do it? Philip Davies: I was not saying that the hon. Gentleman's constituents are stupid; I was saying that he seems to think his constituents are stupid. I do not think they are, which is why I do not think that we need to intervene, as they are more than capable of distinguishing a packet that says Tesco on it from a packet that says Kellogg on it. The hon. Gentleman obviously does not think that they can. Mr. Frank Field (Birkenhead) (Lab): I want to explain briefly why I will not be supporting the Government tonight. Mr. Eric Martlew (Carlisle): There is nothing new about that. Mr. Field: That is true, and it is a sadness for me, but clearly not a big enough sadness to the hon. Gentleman. Mr. Eric Martlew (Carlisle): One of the homes that they [contractors commissioned by the Environment Agency] saved that night was mine. I and my neighbours were out until 2 o'clock in the morning working with the contractors, who worked for 24 hours non-stop. To be honest, we had very little help from the district council, but with the contractors' help we managed to save not only the houses, but the biscuit factory that employs 1,200 people. Huw Irranca-Davies, The Parliamentary Under-Secretary of State for Environment, Food and Rural Affairs: My hon. Friend is absolutely right. Heroic efforts were made by all concerned to avoid the worst. The impact could have been far worse than what we saw, bad as that was. Cockermouth, Keswick and Ulverston have all benefited from investment and more is planned. In Keswick, for example, the Environment Agency has done a study to justify improvement works and has allocated funding to design works in 2010-11 for construction at an estimated cost of £5 million. For Ulverston, funding has been allocated in 2010-11 to develop a scheme for Dragley beck, which is programmed for construction in 2011-12 at a cost of £2 million. That project would raise the existing one-in-20-year standard of flood protection to one in 70 years. For Cockermouth, indicative funding is in place to begin studying a potential scheme in 2012-13. We have already seen what good investment can achieve in places such as Carlisle, where some 3,000 properties were saved from flooding, as my hon. Friend the Member for Carlisle (Mr. Martlew) said. In Appleby, a flood action group was set up in 2005. The residents of The Sands, which has no formal flood defences, have taken advantage of the DEFRA property-level flood resilience grant scheme to install flood-resilient and resistance measures on their individual properties, the cost of which averages out at about £2,000 a property. Forty-six properties were protected from flooding by those simple, easy and cost-effective measures. We need to tackle the problem at all levels. My hon. Friend the Member for Copeland has rightly made it clear that we do not focus just on the larger communities in west Cumbria. There is a long list of projects in Cumbria for which the Environment Agency has identified an indicative allocation of expenditure. In his constituency, they include projects at Nor beck in Cleator moor, Skirting beck, Low Mill and the River Ehen in Egremont. The provision of community flood defences in those locations is subject to the necessary project appraisal, as always, to find solutions that are technically, economically and socially acceptable. Mr. Eric Martlew (Carlisle): I thank the Prime Minister for his words of comfort and encouragement to the people of Cumbria today, following last week's devastating floods. In 2005 my constituency was flooded, and the Government were very generous in providing resources for flood defences. It will cost £40 million just to rebuild the bridges in west Cumbria, and probably the same amount to rebuild the roads. Will the Prime Minister assure us that he and the Government will be able to help? The people of Cumbria cannot afford to pay that bill. The Prime Minister: My hon. Friend is absolutely right-100 flood protection schemes have recently been brought in. One of them is for Carlisle, where £40 million is being spent to make sure there is proper protection against the floods that did so much damage the last time, and I understand that in the recent times about 3,000 properties were prevented from being flooded as a result of those new flood defence arrangements. We will look at what we have done. I have said already that the Environment Agency budget and the other budgets for dealing with flood defences will rise to £800 million in 2010-11. That is a sign of our commitment to making sure the whole country is best protected against flooding.